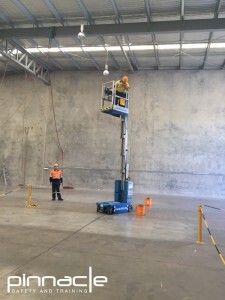 Trains participants in the use of scissor lifts and boom-type EWPs under 11m. Equivalent to ‘Yellow Card’ training. Please note that this is the nationally recognised unit of competency. It is recognised and accepted throughout Australia. Please be aware that “Yellow Cards” are issued by an industry body outside of the VET system. 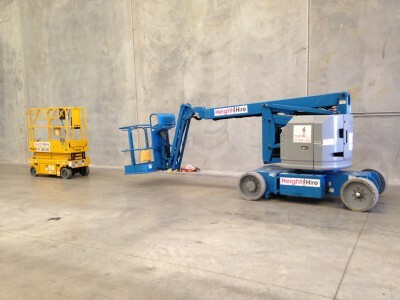 You do not require a Yellow Card to operate an EWP or scissor lift. This is a common misconception. 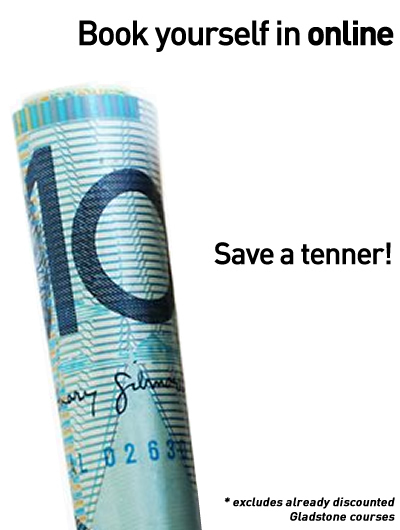 QLD: Funding is available for eligible members of the construction industry. Eligible students can do this course for only $119.00! Check your eligibility and apply now. 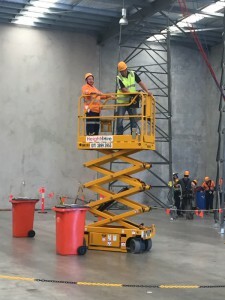 This course is designed to give participants the knowledge and skills to operate elevating work platforms which are not classified as requiring a high risk work (HRW) licence. 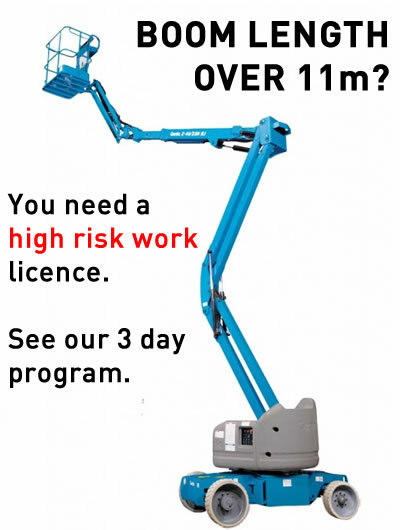 If you need to operate boom lifts that have a capacity beyond 11m, please see our EWP over 11m course. *The unit RIIHAN301D covers the operation of a range of elevating work platforms under 11m. 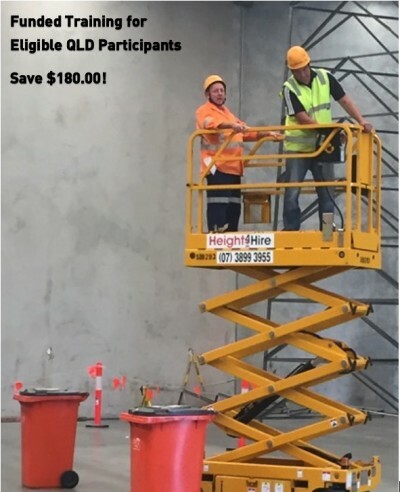 Our course will provide participants with skills and knowledge to operate elevating work platforms that are transferable to any EWP under 11m. 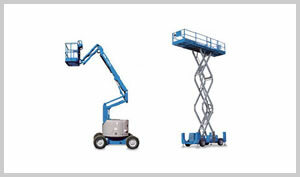 The specific plant used in our training courses are boom lift (BL) and scissor lift (SL). All Australian work sites have an obligation to induct new workers on the plant they are required to use. However, we do recommend that workers check with their employer(s) as to the applicability of any training related to on-site plant and equipment, as well as any site-specific training requirements. Competent students will receive a card detailing the unit of competency and the class of machines they were trained and assessed in (at this time, boom [BL] and scissor [SL]). For on-site training (group courses) we can contextualise the training to the specific plant being used on site and identify this on the card issued to competent students. Arrive in suitable attire: Safety boots, long pants and high-vis shirt. This was the best short-course I have completed during my 11 years in the construction industry. I recently attended the EWP Under 11m course at Silverwater. I walked in with no experience and walked out confident. No need for a long review here, you attend these training facilities to achieve the competency and I did just that. Well done Pinnacle, you are way ahead of the competition. Really good training, great environment and friendly staff - trainer and admin. I felt a lot more confident after the course and would take on the big task that I was not sure of at first. Jason, the trainer was very informative and had great experience in the field which was carried over in the classroom. Well done, I’m looking forward to my next course.